Left-handed vertical mouse: how steep is the learning curve? Main keyboard: IBM Model F 6110344 "Battleship"
I'm right handed. I'm three days in now, getting a bit more natural but it still feel quite clumsy to work with. Anybody have experience on that? How steep can I expect the learning curve to be? I tried that a few years ago (but with a regular mouse, not a left-handed one). Took me a couple weeks to adjust, but wasn't hard. I then went back for no real reason and haven't tried again — perhaps I should. I have owned a left-handed vertical mouse only for a week, but I regularly use right-handed "vertical" mice. For me, it was the different-handedness that was the hardest to get used to, not that it was vertical. Did you go with the left hand for ergonomics? It took me 2-3 months to get back up to speed switching from QWERTY to Dvorak keyboard layouts, I think that would be a much longer process than changing mice hands. I use a righty Anker which only took a few days to get adjusted to - best of luck. MajorMajor wrote: ↑ Did you go with the left hand for ergonomics? That, and optimal keyboard-mouse combination. 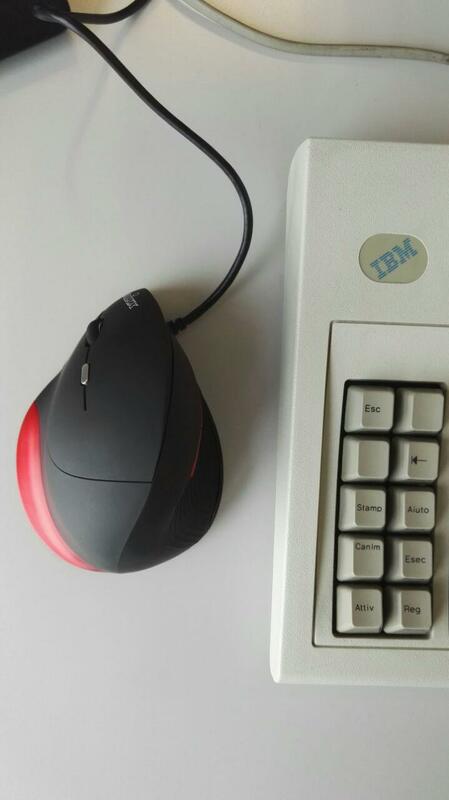 I should mention that it does not matter if the mouse is vertical... I think. I've been using a right-handed vertical mouse from more than 6 months now; I could use it almost as fast as a regular mouse right off the bat. Just keep going. Vertical mice (left or right) feel really clumsy at first, and after a few years I'm still faster with a flat mouse in my right hand, but after a while that would start to hurt. In my my, the transition was well worth it. To me, true "vertical" mice are no good but 45-degree mice are about ideal. I have used right-hand vertical mice for several years, but I keep a standard symmetrical mouse (Microsoft Optical) on the left side. Some years ago I used a right-handed Evoluent every day at work. The biggest annoyance for me was not the shape but that that mouse "corrected" vertical and horizontal movements to be precisely vertical or horizontal. Having moused for most of my life I had a feel for where the pointer was supposed to be when I moved it. I don't know if they have changed it since in newer models. Maybe trying to distinguish those subtly different shades of purple slowly damages the mind …At least we're no longer blaming Alps for insanity. Vertical mice sacrifice speed and precision for comfort. Personally, even after using a vertical mouse for months, when I switched back to a flat mouse, I was both faster and more precise with my clicking, but less comfortable. However, perhaps my experience is anecdotal. rich1051414 wrote: ↑ Vertical mice sacrifice speed and precision for comfort. Personally, even after using a vertical mouse for months, when I switched back to a flat mouse, I was both faster and more precise with my clicking, but less comfortable. However, perhaps my experience is anecdotal. I agree to you, my experience is similar. I could not be the same precise with vertical mouse as with the regular one even after a weeks of using it. Vertical mice sacrifice speed and precision for comfort. I could not be the same precise with vertical mouse as with the regular one even after a weeks of using it. Were either or both of you using the horrible Evoluent mouse? In my opinion, that is the worst mouse ever made, impossible to control and wretchedly uncomfortable. Try a 45 degree mouse like the Anker or Joy Pen before you give up completely.